Vascular ultrasound can assess the carotid arteries, abdominal aorta and deep venous system. Doppler and color Doppler ultrasound is used to evaluate blood flow. Carotid ultrasound is used to evaluate the carotid and vertebral arteries in the neck for narrowing abnormal blood flow. This examination is painless and there is no radiation or intravenous dye. How is carotid ultrasound performed? While lying on a table, warm gel is placed on the neck, overlying the carotid arteries. Images are generated utilizing real time ultrasound which evaluates the blood flow in the carotid and vertebral arteries to determine if there is narrowing and blockage. Exam takes approximately 45-60 minutes. Carotid artery screening uses painless, non-invasive ultrasound imaging to image the carotid arteries in the neck for plaque and narrowing. A stroke can result from the disruption of adequate blood flow to the brain. The most common source of a stroke is a significant narrowing or blockage of the carotid arteries caused by accumulation of fatty plaque along the carotid artery walls. The carotid arteries are the main blood supply to the brain, and plaque buildup in these arteries is the leading cause of stroke. How is carotid artery ultrasound performed? Gel is placed on the neck overlying carotid arteries. 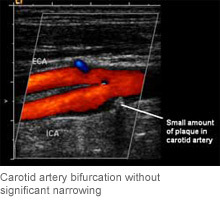 Images are generated utilizing real time ultrasound to determine if there is narrowing and blockage of the carotid artery. Exam takes approximately 30 minutes. A lower venous duplex sonogram ultrasound study is performed using sound waves to evaluate the lower extremity for blood clots in the leg veins. This examination is painless and there is no radiation or intravenous dye. How is venous ultrasound performed? Ultrasound gel is placed on the legs. Images are generated utilizing Doppler and color Doppler ultrasound, which evaluates blood flow. The test takes approximately 45 minutes. Do I need an order? What is the benefit of a carotid ultrasound? What are the limitations of carotid ultrasound imaging? What are the benefits of venous ultrasound?